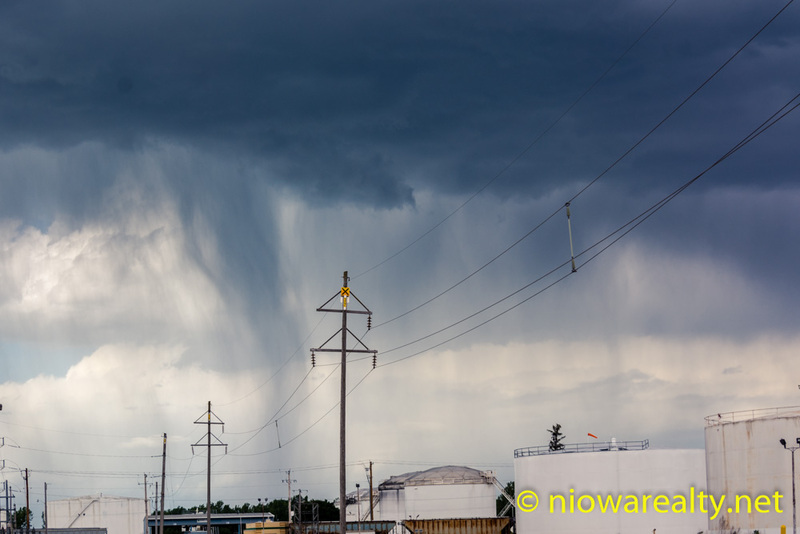 Share the post "Industrial Rain"
It was surprising to find it raining off and on today. Thank goodness I got my outside menial chores done before the intermittent light showers started. I did a little mowing at a property and while there, I couldn’t help but notice how poorly the so-called middle to lower tier of today’s homeowners take care of their yards. They seem to make an attempt at mowing, but they don’t keep the volunteer trees and weeds from growing where their mowers can’t get at to cut. This leaves me to really wonder what over fifty percent of our general public do during their free days and evenings. My public open house at 1202 – 2nd St. NE was a great success to where there were people coming and going the entire time. Thank goodness I printed out extra information sheets because I handed out my last one to a late arrival. Everyone was spellbound by the views it affords of the Winnebago River. I teasingly said to one, “You’re buying this site for the views, and the home comes with it.” She actually agreed. I’ve admired this homesite for a great many years and know full well its future owners are going to have their own “in-town” sanctuary. Just today I was finally able to get a sale put together that’s been bouncing around for nearly two weeks. Thank goodness this marathon negotiation is over. When dickering continues on for so many days, the hard feelings begin to build along with quirky little requests being taken far too personal. As normal with every year, over a month or so ago I was asked to buy a ticket or two from the Evening Lyons Club which holds their chicken barbecue every year from 11:00 am to 7:00 pm during the Cannonball Days. I purchased a ticket at the time and remembered this morning that I had it, so around 5ish I drove over to East Park for a take out. After what I experienced this afternoon, I’m not so sure I’m going to buy a ticket next year. Since I couldn’t get into the “drive-thru”, I had to find a place to park about a block away and walk there. No problem. When I went to the take out line, I discovered there were no baked beans or coleslaw. I said to the lady holding a ladle full of slimy and sticky macaroni salad, “Where’s the coleslaw and baked beans?” She quickly snapped back at me and said, “We’re out! Do you want macaroni?” When the guy handed me their styrofoam container I said, “I don’t think I’ll be doing this next year.” Listening to the comments from the people ahead of me, I don’t think they were the least bit satisfied as well. I fully understand that many of these events being held are for charities, but my gripe is they shouldn’t be offering something they can’t deliver. I’d rather have just given the guy $9.00 that day and called it good to go. I guess I’m too old fashioned when it comes to serving guests to where they should always be given the best food and the best service. That’s what makes memories along with them looking forward to next year. On my way back from Clear Lake this afternoon, I spied a not so often seen occurrence. I noticed it raining heavily in the distance, so I pulled off and took the above photo. I thought it was a good shot of “industrial” rain. I’m now ready to go warm up my Cannonball chicken without the promised coleslaw and baked beans. Bon Appetite!